Long before pink hats became something of a controversy among Red Sox fans, the Yankees tried to popularize them among their own fans. June 23, 1991 against Minnesota was Yankee Stadium's first and last "pink hat day," as every fan in attendance was given one. The Yankees were more prepared to play in front of 37,000 points of pastel brilliance than the eventual world champion Twins, who fell to the Bombers 11-2. Although largely forgotten, Pink Hat Day lives on in just about every baseball card set from 1992, as it seems every card company but Upper Deck had their photographers at the Stadium that day. 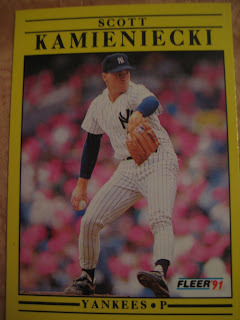 Scott Kamieniecki won his second major league start, improving to 2-0. He allowed six hits and two runs in 7 and2/3 innings, walking one and striking out three. After the game he learned that real big leaguers don't clean their own cleats. Jesse Barfield had a rough day, going o-4. He made two of the three outs in the Yanks' six-run second inning, including the at-bat shown here, a fly-out to left off of Paul Abbott. Barfield was the first batter Abbott faced in the game. Paul ended up pitching 5 and 1/3 innings, allowing four runs but striking out seven batters. Terry Leach relieved Abbott and gave up one run on three hits in the eighth inning. The run Leach gave up was this RBI single by Carlos Rodriguez, who replaced Barfield in the lineup as part of a double switch. Don Mattingly scored on this base hit. Closer Steve Farr finished the game off with a scoreless ninth, striking out two Twins. 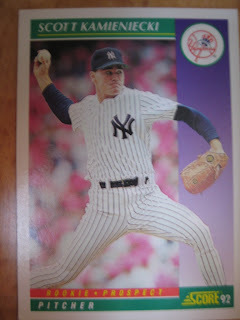 Another fun card from 1991 Donruss that came from Rich is "Dr. 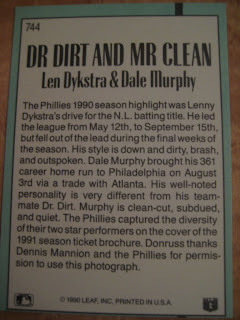 Dirt and Mr. Clean," featuring the clean-cut Dale Murphy (who now hosts an anti-steroids website) and the down and dirty Lenny Dykstra (now a stock trader) in a posed publicity shot for the Philadelphia Phillies. 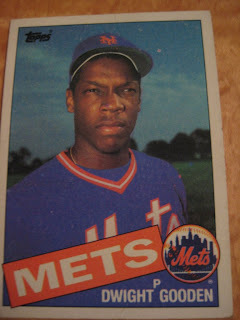 (Because it is a team's photo, it is the only card in the set without the Donruss logo). 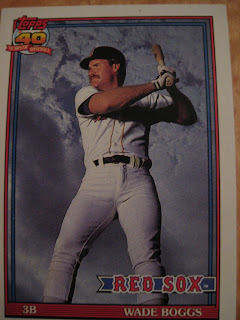 Interestingly, Donruss admits that it was a publicity shot, even thanking the Phillies, specifically Dennis Mannion. Who is Dennis Mannion? Not the photographer, as I would have guessed, but the Phillies marketing executive who gave Donruss the permission to use the shot. He is now the Chief Operating Officer of the Los Angeles Dodgers. He also likes the Dave Matthews Band, Brooks Brothers aftershave, Grey Goose, Ben & Jerry's, and Denver Nuggets’ remixed music (combing techno and classic rock). I am not making this up. I got this card of Danny Jackson in my trade with Rich. 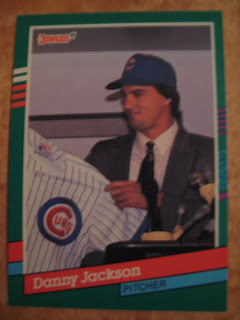 It comes at the end of the 1991 Donruss set, with Danny Jackson at his press conference where he joined the Cubs. What I didn't notice right away is that the picture actually uses the Cubs logo on his jersey in the lower left corner of the card, theplace where the team logo normally goes. 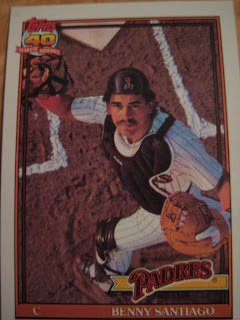 Here is a typical 1991 Donruss card to show what I mean. Here is one of the cards from the bunch from Rich. It features Jose Canseco's ill-fated pitching attempt on May 29, 2003 in Boston. Not only did he give up three runs in the Rangers' 15-1 shellacking at the hands of the Red Sox, but he injured his arm, requiring season-ending surgery, and his career never was the same. Too bad Score's photographers weren't at the Rangers game in Cleveland three days earlier. They could have captured one of baseball's all-time bloopers - a long fly ball bouncing off of Canseco's head over the fence for a home run. Was that incident ever captured on cardboard? Got a great package of cards today from Rich in Nevada. Though he doesn't have a blog, he does have a site with plenty of wants - I was able to complete four sets for him, including 1987 and 1989 Topps, as well as hit a bunch of wants from other sets. In return, I got a great stack of cards from my wantlist. 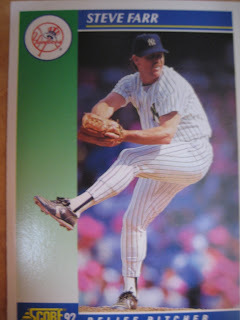 I still remember when the 1991 Topps set came out and the Boggs and Santiago cards, as well as that of Roger Clemens, were hyped as the examples of the radical new Topps, responding to Upper Deck with a new, more gimmicky style of photography. Over the years I have acquired most of the 1991 set, including Clemens when it first came out, but these two had eluded me. Can anyone finish these off for me? Check out the link on the right side for my full wantlist as well as what I have to trade. My last post included an example of old technology on a baseball card, with the rotary phone hovering behind Trevor Wilson. Of course, in this day and age, it doesn't take long for new technology to become old. For example, would this card count as old technology? 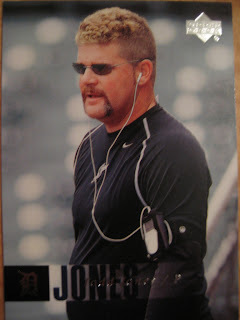 It is a 2006 Upper Deck Todd Jones. Jones is wearing an iPod, which is a very modern technology. However, the size of the iPod seems to be much bigger than what is the norm in 2009. So would a 2005 iPod count as "old technology"? Trevor Wilson's 1990 Upper Deck card features the young pitcher smiling broadly for the camera. This is despite his team dropping a 1-0 game in Los Angeles, a game Wilson did not appear in. Why the happy face? Because it is September 27, 1989 and the Giants have clinched the National League West, thanks to the Padres losing their game against Cincinnati. Behind Trevor, you can see some of the preparations the Dodger clubhouse people made for the Giants clinching celebration. The papers on the wall are covered in plastic, and the phone has been taken off the hook and the rotary dial (how's that for some old technology on a baseball card!) has been duct taped. I'm not exactly sure how that protects the phone - maybe they don't want champagne-filled Giants drunk-dialing their future NLCS opponents, the Cubs? In terms of figuring out what happened when a photo was taken, no sets were better than 1997 and 1998 Upper Deck. 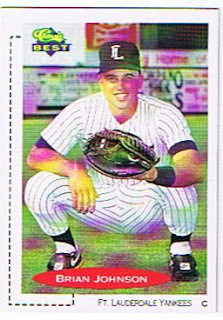 In all the 1997 and some of the 1998 cards, there was a caption describing what was going on when the picture was taken. 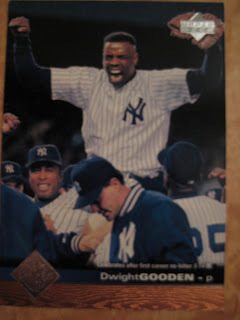 For example, Dwight Gooden's 1997 card features the celebration from his no-hitter. As it was a night game, it's unlikely Upper Deck photographers were there; the company probably bought a file photo. Paul O'Neill's card is a bit more cryptic. 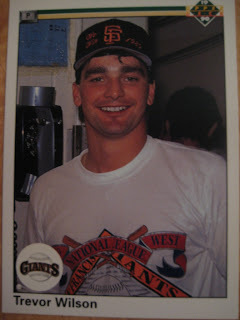 It features him with bat in hand and says "posing for a baseball card photo, 6-1-96". O'Neill seems too intense to really be paying attention to the photographer; more likely he's taking practice swings in the on-deck circle. 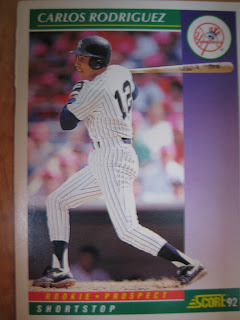 Both O'Neill and the Yankees had a good day that afternoon, was O'Neill was one for three with two walks, two runs scored and two RBI, as the Yankees won in Oakland 6-3. 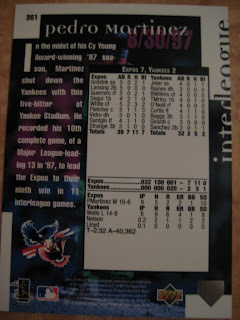 The next year, Upper Deck didn't put captions on the cards, but they did commemorate many of the interleague games, as 1997 was the first year of that particular experiment. 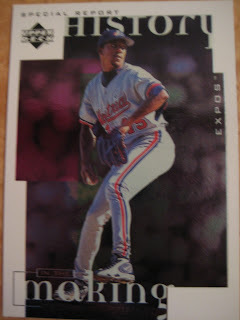 One of the cards featured Pedro Martinez's five-hit complete-game throttling of the Yankees, back when he was a Montreal Expo. 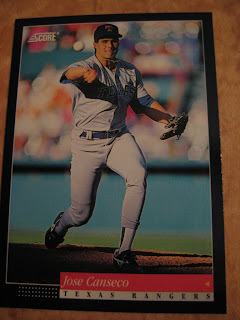 Like the 2008 Stadium Club Joba Chamberlain featured on a recent Dinged Corners post, this card commemorates a game I actually went to. 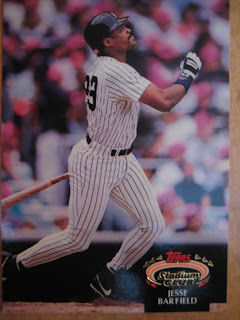 While this card accurately displays Pedro's dominance on this day, it doesn't capture the ugly mood at Yankee Stadium, where there were many fights in the stands between frustrated Yankee fans and Pedro supporters waving Dominican flags. The ugly mood extended beneath the stands, as unbeknownst to the fans, David Wells got in a fight with George Steinbrenner in the clubhouse after being taken out of the game. Does anyone else know of a card that features an image from a game they actually attended? How did they do on the day the card photo was taken? 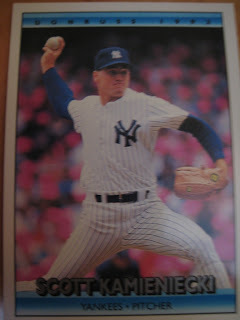 Another recent Dinged Corners post featuring some current Stadium Club cards included a play from a game I was at this year - Joba pitched great as well as fielded great as the Yankees won. It is not often you can tell which game a card is from, but when you can it can really be fun. Retrosheet.org is a great website which, if you are not familiar with it, gives the boxscore to every game going back decades. It can be a great tool for finding out more about a certain picture and helping to "bring the card to life". For example, here's an easy one. 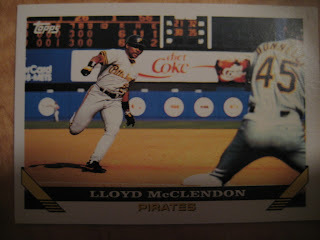 The Shea Stadium line score can cleary be seen behind Lloyd McClendon in this 1993 Topps card, so it is a simple matter of going through Pirates at Mets game from 1992 and see what line score matches. As you can see, it is tied at six in the top of the tenth. From retrosheet, we learn that this game is from August 12, 1992, and McClendon is scoring what would end up being the winning run in a 7-6 affair, scoring from first on Jay Bell's triple off of John Franco after McClendon hit a two-out single to keep the inning alive. Sometimes a little more detective work is need. 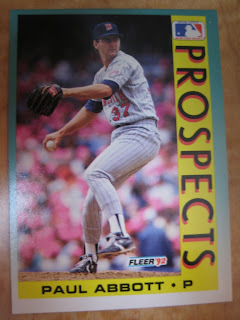 How can you possibly know what game the 1993 Upper Deck Randy Milligan is from? You can't even tell what park it is in. Nevertheless, there is a clue, though you may need the actual card, rather than my image to see it. (By the way, it looks like I don't have the settings on my scanner that are necessary to prevent the purple dots - which I have learned are called moire, so the pictures on this blog are going to be from photographs of the cards, which I am getting better at). The clue that gives it away is the trainer's watch. It is one of those digital date-and-time watches, and the date is May 12. Knowing that the year is 1992, we got to retrosheet and find the Orioles game from May 12, 1992. Baltimore was at Texas on this day, and beat them 5-1. Milligan would go one-for-four, singling in the seventh before leaving the next injury with an injury to his right leg. The injury kept him sidelined for a couple of games but was not too serious as he was back in the lineup in Chicago three days later, reaching base twice in four trips. Dinged Corners has a very interesting new post on recursive cards. These are cards which feature a player holding that card - essentially an infinite image. The two cards that fit this bill are the 1989 Upper Deck Gary Pettis and the 1993 Upper Deck Mike Perez. They also show the 1982 Fleer Pete Falcone, holding a picture of his 1981 Fleer card. 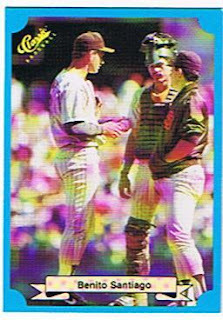 While the special effects involved in creating recursive cards are, I suppose, somewhat difficult, it has been easier for card companies to show players holding another card. 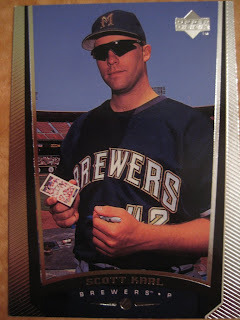 For example, here is a 1999 Upper Deck Scott Karl, holding his 1998 Upper Deck Collectors Choice card. 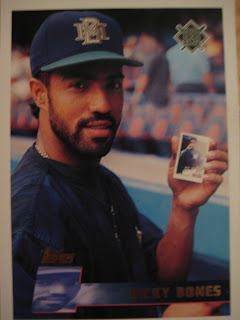 Here is another Brewer, Ricky Bones, on his 1995 Topps card, holding a 1994 Topps card of himself. 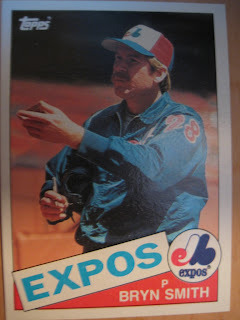 In the 1985 Topps set, photographers caught Bryn Smith autographing a card for a fan. You can only see the back, and that orange and yellow color scheme would seem to indicate that it is a 1983 Topps he is signing. Usually, card makers are smart enough to only display cards of their own manufacture. 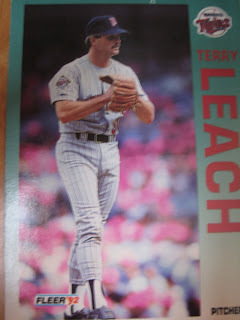 However, look closely at the 1990 Fleer Larry Sheets. 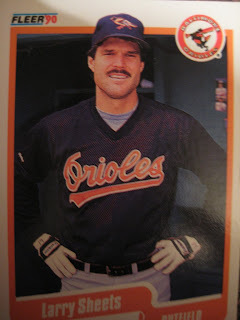 Behind him on the dugout wall, there are 1989 Donruss cards of fellow Orioles Pete Harnisch and Curt Schilling. 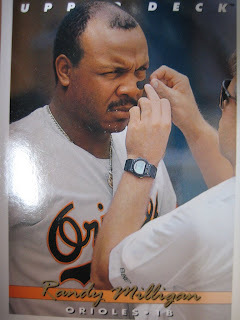 If Fleer didn't fire their Orioles photo editor in 1989 after the Bill Ripken debacle, they certainly should have fired him in 1990 after he gave free advertising to a competing card company! Are there any other example of players with cards on their cards, either from the same or another company? How does one scan baseball cards? Welcome to Baseball Cards Come to Life! Hello, welcome to Baseball Cards Come to Life! 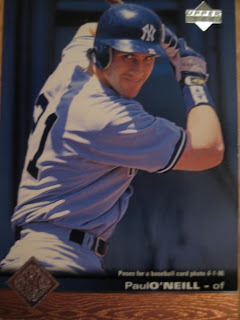 For several years now, I have been reading some of the other great baseball card blogs, and I finally feel ready to contribute. 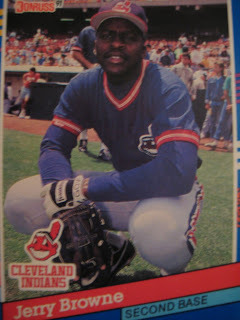 To give a little background, I began collecting baseball cards in 1986 (age 9). I collected very heavily from then until 1994. I began collecting again in earnest around 2000, and have focused more on filling sets from the era I first collected. However, I am an omnivorous collector, and enjoy any card that comes my way, whether 1986 or 2008. The only boundary I have set is to not actively collect pre-1978 cards, though I do have a few that have found their way in my collection. I am not an elitist about my cards; the so-called "commons" are just as exciting to me as the "stars", and enjoy the card of someone of someone who had just a cup of coffee in the majors as one of a Hall of Famer. I am a Yankee fan and Cardinal fan, but collect and enjoy cards of all teams, even the Mets and Red Sox. A few years ago I started trading cards online, which is how I first got involved with baseball card blogs. 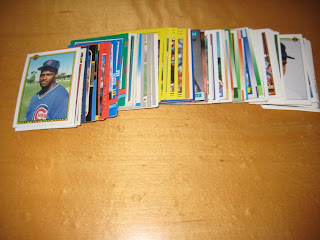 You can see some of the trades I made with Paul's Random Stuff, Thorzul, and Saints of the Cheap Seats at their blogs. Some other blogs I have traded with or gotten free cards from are BadWax, 88 Topps, Stats on the Back, Cards on Cards, TribeCards, White Sox Cards, Whose Card Is It, and the iconic Baseball Card Blog. 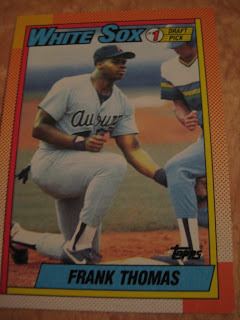 Blogs like these and the creators behind them have helped intensify my obsession with baseball cards. I am up for trades any time and need a great many more cards than are on my wantlist. One thing I like is errors and unusual pictures on cards. Although I collect all cards, I have a special fondness for these. One thing I love about the baseball card blogs is that I am always learning about more wacky pictures on cards that I need, which I then add to my wantlist. Pictures like these are really fun, and most of my future posts are going to concern cards like these.